As is tradition, the ship’s bell was used as her christening bowl during that ceremony in 1996, and Victoria’s name was subsequently engraved inside the bell to commemorate the occasion. Thanks to the Nash family, this same bell will now go on board the new Royal Princess, third of the name. The second now saisl as P&I’s Adonia. “Capt. Nash was presented with the ship’s bell from our original Royal Princess following its decommissioning, and we are delighted that he has very generously offered this bell to be placed aboard our new Royal Princess, in honor of his daughter,” Buckelew said. Following Fincantieri tradition, the float out of a ship is celebrated when the godmother cuts the cord that begins the flow of water into the ship’s dock. Victoria Nash was chosen because she has a special connection to the first Royal Princess – as a baby, she was christened aboard that ship. Delivery of the 141,000gt vessel is scheduled for spring 2013, while a sister ship, whose construction will start this month at the same yard, will be delivered in 2014. A third ship, not the same but based on the same platform, will be delivered to P&O Cruises in 2015. 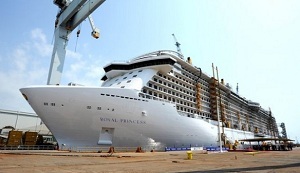 The new Royal Princess is 1,083 feet long and 125 feet in beam, making her the largest ever built by Fincantieri. She has 1,780 cabins, 1,438 of which (81%) have balconies. She will accommodates 3,600 passengers on double occupancy.